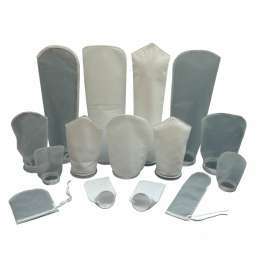 Filter bags made from different materials and filtration grades makes it possible to select a suitable filter bag with regard to the respective operating conditions. The filter bags are manufactured of monofilament fabrics (nylon, polypropylene, polyester) or needle felt (polypropylene, polyester) and are available in different sizes and filtration grades. They are available with sewn in galvanised steel, stainless steel or cast on plastic ring. We also produce a variety of other screening fabric products, such as, screen inserts, screen bags, former filters, filter inserts for lattice boxes for simple sludge drainage, sieve bags and much more.